wondering who has put screens on their hatches and companionways? living in New England insects seam to be everywhere and I was looking at easy ways to but screens in my hatch and companionway of my F25. I was thinking of using snaps for the hatch and making framed screens which could slide in the companoinway opening. I've got a 40/40, but have the same issue. 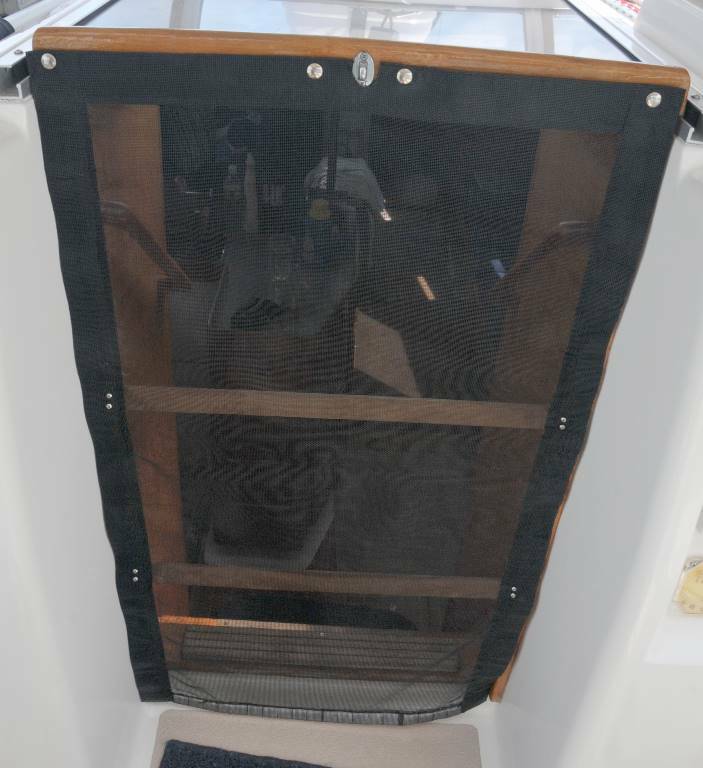 Basically the way that we solved it was to take a piece of screen material and put snaps in the top of it which attach to the top of the sliding companionway cover. Then we have 2 wooden slats that are attached to the screen material at 1/3 and 2/3 of the way down which slide into the slots that hold the companionway panels in place. Then at the bottom we use fishing weights to hold it down. The whole thing just rolls up for storage. I'll try to get a picture of it later today. I made the same thing as Geoff for the companionway: a Sunbrella border around some screen material, made a bit wider than the companionway and as long as the sliding hatch and the drop board together. There’s a broomstick sewn into the bottom of the border for the part of the screen that covers the drop board part. There are snaps that hold it in place mounted on the 4 corners just outboard of the track for the sliding overhead hatch. I can unsnap it or just lift the drop board part and crawl under it to get in and out. Not an absolute bug-proof seal, but it seems to work well enough. I also found some screens that have a fuzzy-part Velcro border around them. They came with a thin peel and stick hook-part Velcro strip that goes around the underside of the overhead hatches. Once the Velcro is in stuck in place the screens stick in place in seconds. I didn't forget about you...Just got busy trying to get cruising again. Anyhow, here's our current screen. Note that the weights at the bottom are plastic coated drapery weights that you get at a fabric store. They don't make as much noise as fishing weights if they bang due to wind. The screen that we use came from a canvas maker as it's a lot more robust than you get from Home Depot. Also, the sides are reinforced with webbing. The wooden slats are much thinner at the edges to slide into the panel slots than they are elsewhere. We only tuck the slats into the track when we seal our selves up for the night or the bugs are really bad. Otherwise you can just flip it up and exit. Has anyone attempted making wooden companionway screens? I saw this (not for a Freedom) and I'm thinking about giving it a try for our '82 Freedom 33. I just had screens that look exactly like the prior post made for BlueJacket and they work great. I had screens similar to the ones shown in the picture. They were made from 1/4" plywood, cut out for the screens and the screens epoxied into place. I often used the screens in place of the hatch boards with the boat on her mooring for good ventilation. The previous owner of my F38 made this, but never finished it. They gave it to me as an empty teak frame with a piece of screen and some of that rubber gasket stuff that fits into a channel around the edge and tensions the screen as it's pressed down. It was really simple to finish and it works pretty well. I still haven't figured out a good place to store it when not in use.